I was almost giddy when I discovered some bird's nest fungus, or Nidulariaceae in one of our flower beds this fall. Giddy? Yes. I think these are some of the most beautiful little fungi around. Because they are small, they might go unnoticed during a walk in the woods. As the name suggests they look like little nests full of eggs shrunken by a shrink ray! Fungus comes in such a wide variety of forms with fun and quirky names. Witches butter, turkey tail and hairy curtain crust just to name a few. Although you should always err on the side of caution when it comes to investigating mushrooms and other fungus with kids, they are fascinating organisms to search for. 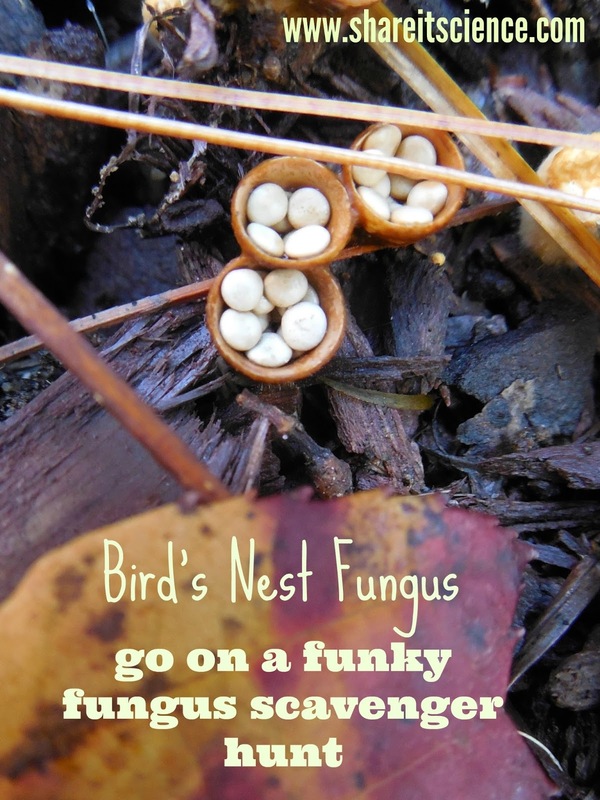 Why not go on a funky fungus scavenger hunt? Keep a "leave no trace" policy and rather than touch or pick the fungus, photograph it or sketch it with some colored pencils in a nature journal. How many different types can you find? Grab a field guide to help you identify and learn more about your discovery. If you are exploring with adults or teenagers and there is no risk of anyone taste-testing something they shouldn't, you might want to try making spore prints from mushrooms. Not only can this help you identify your fungus, but they are also beautiful! What type of funky fungus did you find? Share your pictures with us on Facebook or Twitter. With kid's birthday parties to attend and the gift-giving season looming ahead, many of us are probably thinking about gifts. This can get tricky. Who really needs more stuff? Why not give the gift of a hands-on experience? Below you'll find a list of great books that include activities from pure science, to making and building, nature and gardening. 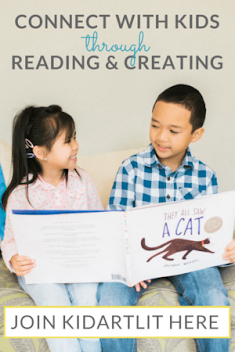 I challenge you to use this guide for elementary age appropriate activity books to choose some activities that you can do alongside a young science-inclined friend, or activities that they can tackle on their own. Give the gift of an experience, rather than stuff! Why not pair a science, STEM or STEAM activity book with the materials that you need to complete one of the projects inside? Set aside some time to explore, invent, build and get curious with your elementary aged recipient rather than buy a gift just for the sake of gift giving. Check out these titles to get you started. This post contains affiliate links, meaning I will make a small commission from purchases made through product links. Please see disclosures for details. More gift ideas for kids ages 7-10. I really love this one, because the nature of "kitchen science" is that you can experiment with all sorts of things that you most likely already have in your pantry. No special, expensive materials required! With 52 experiments, you can try one a week for the whole year! The activities in this book inspire a sense of wonder and involve items that you can find around the house. Encourage kids to explore the questions they are asking anyway, like, "Is slug slime as strong as glue stick?" and experiment to find the answers! 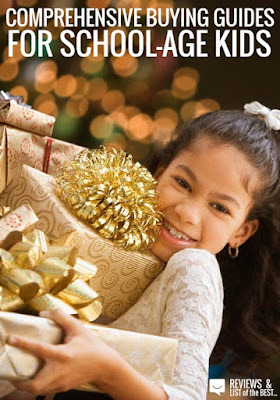 Find more clutter-free gift ideas for older kids. Fizz, Bubble & Flash! : Element Explorations and Atom Adventures for Hands-On Science Fun! Another great title from the Williamson Kids Can! series, exploring atoms and answering all sorts of weird and wonderful questions like "why does broccoli smell?" "what do you have in common with pizza dough?" and "how does static cling work?". Designed for kids 8 and up, but totally manageable for younger kids who have an adult to help. Who doesn't love the idea of being a spy? Not only are these activities fun and engaging, but the book also includes "Spy Science in Action" sections that explain the science principles behind the activities. Why stop at science, when you could combine it with technology, engineering, math and art? Engage the whole brain with these fun activities. This book became a best-seller on Amazon within one week of release! Read my review here. STEAM Kids is also available in an e-book version, which is more economical and includes hyperlinks to additional content. 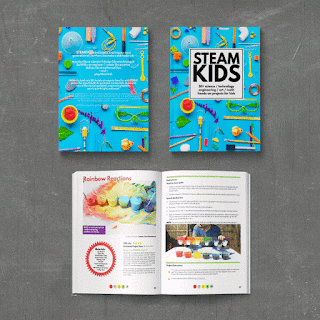 You can pick up the STEAM Kids e-book here, or if you are a resident of the EU, you can purchase it here. 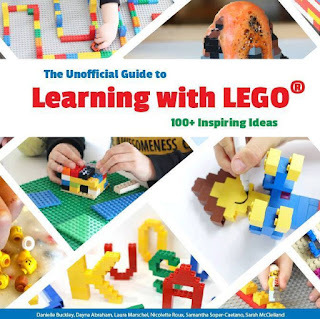 This LEGO book is another one of my favorite new books from this year. Use your bricks to build reading, math and science skills from early elementary on up. Also available as an affordable e-book. You can read my review of the book here. Looking for STEM toys for kids? Although this isn't specifically science related, this one has been a favorite of mine for a long time. With over 100 different dough recipes, you can mix up something that will be the perfect beginning to a model, some creative play, or a great sensory experience. Tons of fun! Not only does Tinkerlab include a bunch of activities that will inspire and amaze kids, it also has a lot of practical advice on setting up spaces where children can explore and be creative. A great book for families. Great images and step-by-step activities that use household items. Projects are fun and kid-safe, so they can be completed on their own, or with an adult helper. Take science outside! A great family book for exploring biology, chemistry, physics and more outdoors! Ditch the screens and get some fresh air. What kid doesn't like to get their hands a little dirty? Fabulous activities that can be done outside from nature potions to dandelion bubbles! Clare Walker Leslie is well known for her books on nature journaling. This one is an excellent guide to becoming a naturalist. Includes many activity prompts for growing closer to the world around you. Such a fun gardening resource. 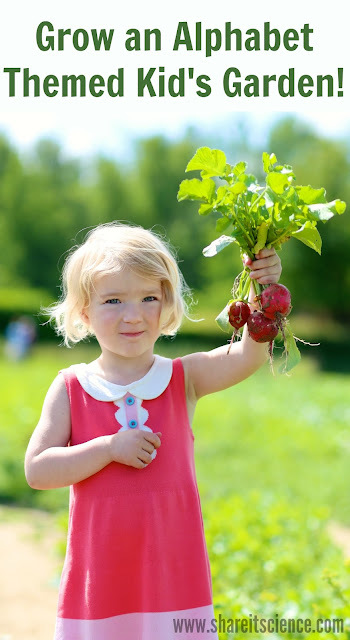 Hands-on garden experiments can be done individually, or systematically during each week of the year. Although this isn't an activity book per se, it is one of my favorites for experimenting with plants. Why not try to grow some ginger or an avocado? Some soil and leftovers from your fruits and veggies are all you need! This is one of the most fun and comprehensive beginning garden books I can think of. From building a scarecrow to winter window boxes, this guide is a keeper. These next books are geared for parents. Despite the titles, each could be used by either Mom or Dad with sons or daughters! From MacGyver science to growing "tasty sea monsters" there are tons of activities here that make science come alive and families will enjoy. Geek Mom = Cool Mom. 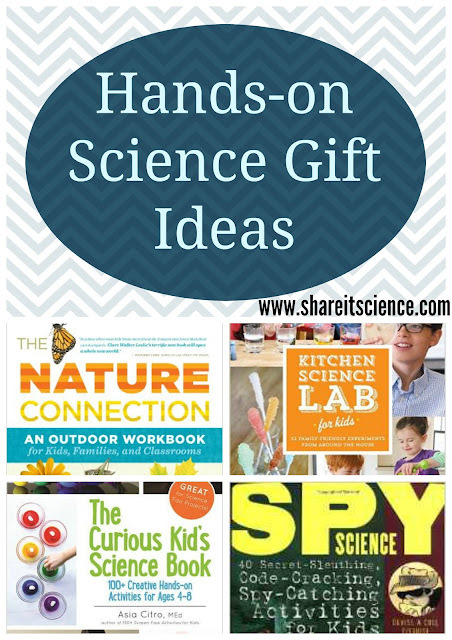 Science projects, superheroes, sci-fi adventures and more! Sure to make all the other kids jealous. The title sums this one up pretty well. From the editor in chief of Make magazine, you'll find all sorts of interesting projects to build and investigate...whether you're a Dad and a daughter, or Mom and a son! Find great toys for building. 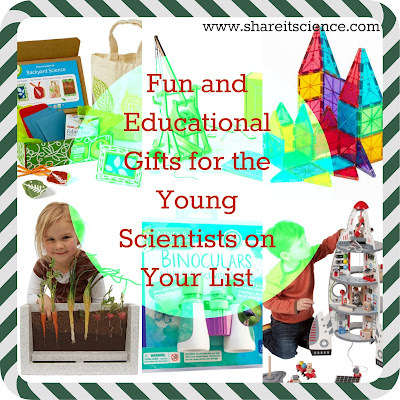 Looking for other gifts for young scientists? Halloween is such a fun time to wow kids with some spectacular, spooky science! Where to start? Things that bubble and fizz? Slime? "Bloody" secret messages? Doesn't sound that scientific to you? Oh, but it is! 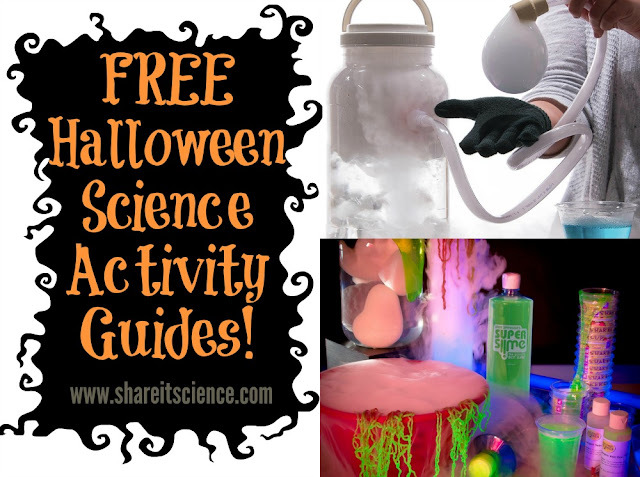 With the background info and activity ideas you find in this post, you too, can make learning science fun this Halloween. Whether you are looking for some dazzle for your science classroom, or for a science activity to keep those kid's hands busy at home, we've got you covered. Here are two FREE downloadable science experiment guides from Steve Spangler science. Read on to find out how you can really knock the kids socks off this October! I'm excited to share two free Steve Spangler Science guides to get you started on some fun science experiments for Halloween. These will be great for spicing up science class, activities for your after school science club, Halloween party, or at-home activities. If you love fun science, then you're probably a Steve Spangler fan. "America's Science Teacher" is known for his fun hands-on science experiments, his popular You Tube channel, "Sick Science", frequent TV appearances on local television stations in his home state of Colorado and national television on shows like Good Morning America, Ellen and on the Weather Channel, or his DIY science show. Who would have thought you could transform a pH lesson into a spooky science activity? In the experiment guide below you'll find out how to make some "bloody" messages on goldenrod colored paper for your friends and to decorate for Halloween. What's the pH science? Basically, the pigments in this paper make it work like a big sheet of litmus paper, and the ammonia mixture is a base that causes and acid-base reaction. You can get the paper here. Download the free guides below for these and 23 other Halloween and dry ice experiments! Looking for more fun Halloween science? Don't miss our Pumpkin STEM activity or this cool dissolving ghost experiment. You'll also love the STEAM Kids Halloween e-book. 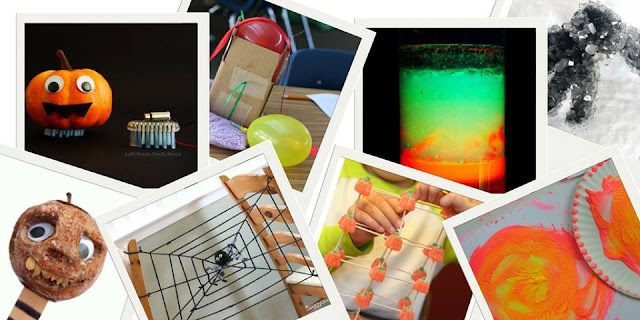 These activities combine science, technology, engineering, art and math. Learn how to make some pumpkin brush bots, fizzing pumpkin treasure rocks, learn some spider web science, and more!